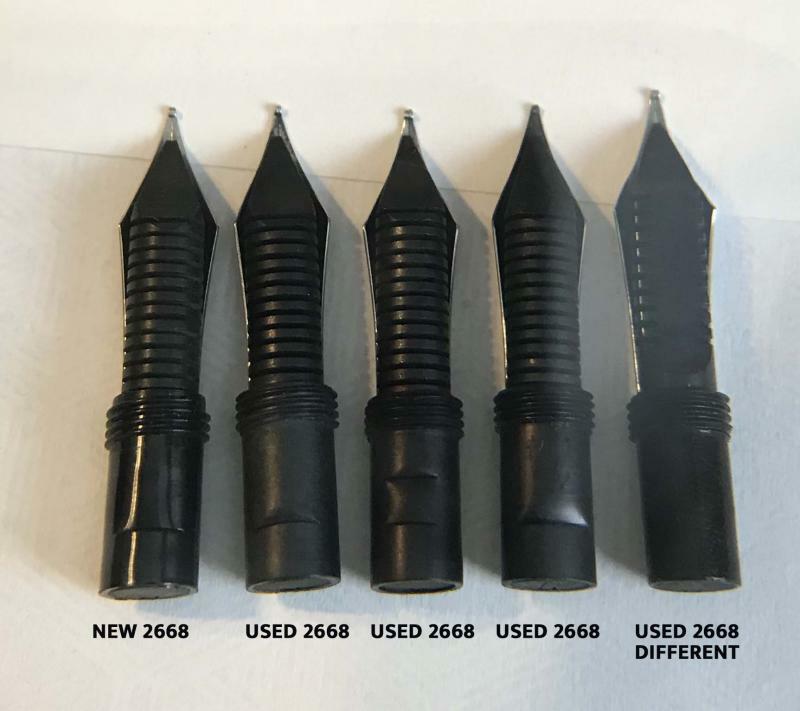 Can someone help me understand the differences between the nibs? The one one the far right and the others. The one in the middle is also different from the others. Even the 4th one has a different set of "flow-cuts" than the others. 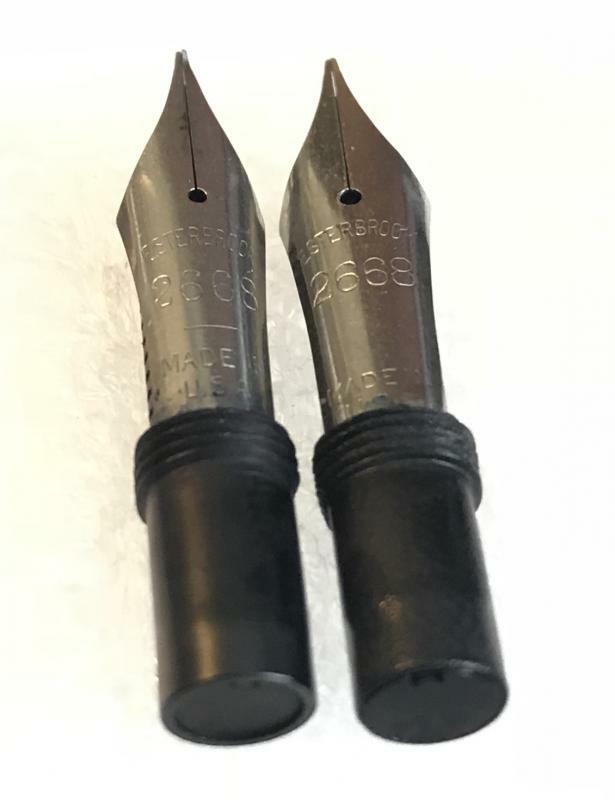 The top of these two nibs is also slightly different. The one on the far right is an earlier model flat-feed. The one in the middle is the latest version, which acts like the Sheaffer "tip-dip" feed. This is your second picture on the right. The others are plain "comb-feeds" with the comb acting to hold more ink. There's a fourth version, made near the end of WW2, which has the comb with a solid rounded bottom (I call it "gunboat" because it reminds me of the hull of a WW2 PT boat). They're all just variations of doing the same thing; getting ink in a smooth "controlled leak" to the point, and changed over the years as improvements came about. The tops were also stamped differently for style reasons, I guess. Thank you. I actually have 2 that have that 4th type-1550 & a damaged 9048. I did wonder if I could replace the 9048 with another nib tip. One of the newer 1550's was inserted pretty poorly-I can see the metal where it tore through the "collar?" that keeps the nib and the comb pressed together. And I was going to say the one on the right was so old and used so much the fins fell off. And the one that Paul called "gunboat" was so old that it filled up solid with old, dried up ink. And then, there was the later UK made versions with the clear collar and the imprint running along the nib, rather than across it. I have one somewhere. Got any of those goofey feeds that the nib sort of wraps around? I do. A few of them. Does the nib wrap around them? 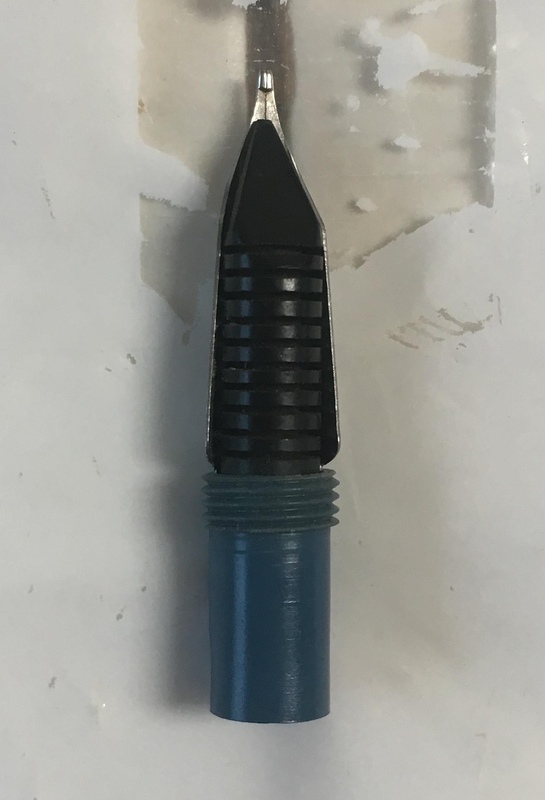 Is it the feed or the shape of the back end of the nib? Edited by gweimer1, 02 September 2018 - 19:10.
you do not find them. They find you . What do you use for bait? I caught one with a Franklin lure.